Luna 2 crash-landed (deliberately!) onto the Moon in 1959. Here are ten facts about Luna 2. Luna 2, or Lunik 2, was the first man-made object to land on the Moon. When we say "land on", we actually mean "crash into the Moon at a great speed." The landing took place on 13th September 1959. Luna 2 was launched from Launch Pad 1 - also now as Gagarin's Start - at the Baikonur Cosmodrome in Kazakhstan at 06:39:42 GMT on 12th September 1959. The Baikonur Cosmodorome is the world's oldest and largest spaceport and the area it takes up is leased by Kazakhstan to Russia. 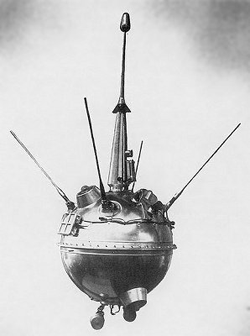 Luna 2 was Russia's sixth attempt to land on the Moon. Its first three attempts all failed to take off. Its fourth attempt, Luna 1, launched in January 1959, actually went to the moon but missed it, flying past it instead. Luna 1 therefore became the first successful flyby mission of the Moon. Another failed launch took place in June 1959, before eventual success with Luna 2. Luna 2 took with it several symbolic pennants featuring the USSR's coat of arms and the nation's abbreviated name in Russian (CCCP). These pennants were found on metallic spheres filled with liquid. On impact, the liquid would explode and would scatter the pennants across the Moon's surface. A replica of one of the spheres covered in pennants that Luna 2 took to the Moon was given to US President Dwight D Eisenhower by the leader of the Soviet Union, Nikita Khrushchev. Just to rub in the fact that his country got to the Moon first. Russia wanted the world to know that they had reached the Moon. They did this by providing the details of Luna 2's trip to Jodrell Bank in Cheshire, England. At the time, Jodrell Bank was the world's largest radio telescope and just about the only one capable of tracking Luna 2 from Earth to the Moon. Jodrell Bank began receiving signals from Luna 2 after take-off. When the signals stopped, this was confirmation that Luna 2 had reached the surface of the Moon as the impact would have destroyed the spacecraft. Impact happened at 21:02:24 GMT on 13th September 1959. Several astronomers confirm that at around the same time, they spotted a flash of light on the Moon's surface. While it was making its journey, Luna 2 released sodium gas. This gas reacted with radiation from the Sun which made it glow. This made Luna 2 easier to spot and basically turned the spacecraft into a man-made comet. Luna 2 would have been travelling at a speed of 3.3 kilometres a second, or over 7200 miles an hour, when it hit the Moon. Amongst Luna 2's scientific findings were that the Moon doesn't possess a magnetic field (or if it does, it is extremely weak) and that there is a flow of plasma coming from the Sun - it's what we now know as the solar wind. The mass of Luna 2 was 390 kilograms. Its diameter was just under 1 metre (90 centimetres).